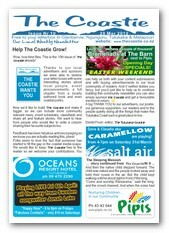 The Coastie - Tutukaka Coast Magazine: Anyone can now read the Tutukaka Coastie online! Anyone can now read the Tutukaka Coastie online! We have created an new Coastie archive in Google Docs where anyone can access back issues of the printed Coastie newsletter and the latest issue of The Coastie online.